Alyssa Graves pitches during a game last season. Graves’ 2.69 ERA last year was fourth-best in the Big East. Jimmy Lafakis/Collegian file photo. Last season was one of discontent for the Butler softball team. The Bulldogs finished 20-28 and missed the Big East conference tournament for the first time in two seasons. But the Bulldogs are back in 2019 with a purpose. Literally. Their mantra for the upcoming season is simply one word: Purpose. The players and coaching staff want every pitch, every hit, every practice, every game — everything — to matter as they push to contend in the Big East conference. “If we’re gonna do it then let’s do it with a purpose, whether that’s to get better or help a teammate, there’s always something to get out of it rather than just going through the motions,” head coach Scott Hall said. The Bulldogs were picked fifth in the Big East preseason coaches poll last month, but with four new coaches in the conference and a number of player departures across the league, Hall said he feels the conference title is anyone’s for the taking. Butler will lean on senior outfielder Jenna Foreman, who was a second team All-Big East member in 2018 and led the team with a .371 batting average. During her junior year, Foreman, otherwise known as “Jet,” stole 35 bases and recorded 63 hits en route to breaking school records in both categories. Despite losing first-team All-Big East member Alyssa Lach to graduation, the Bulldogs return six of their top nine hitters in terms of batting average. Among the returners is sophomore shortstop Maddie Moore, who hit .239 last season before her campaign was cut short after 18 games due to an ACL injury. Do-it-all senior Kaitlin Doud is also back for the Bulldogs. At the plate, Doud hit .243 last season and led the team with six home runs. In the circle, Doud posted a 3.56 ERA in 122 innings. Sophomore Alyssa Graves will highlight the Bulldogs’ staff after she started 25 games her freshman campaign and posted a 2.69 ERA. That number led the Bulldogs and was good for fourth in the Big East. 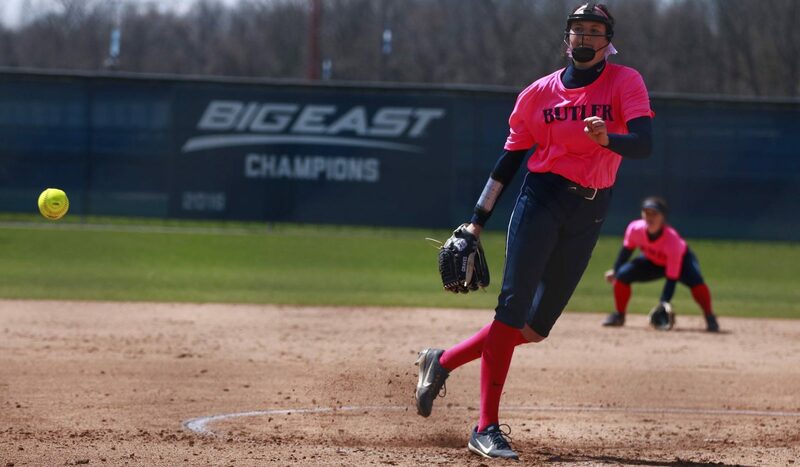 Graves and Doud, the only two returning pitchers for the Bulldogs, are followed by Karli Ricketts, Dani Deuschle and Madison Seigworth, three freshmen pitchers who round out the staff. Graves, a freshman just a season ago, is doing her best to get the young pitchers acclimated to college softball. After several years of a thin roster, partly due to injuries, Hall said depth will be key for the upcoming season. The program has grown 20 percent in terms of roster size compared to last season. The Bulldogs welcomed a freshman class of 10 athletes and are up to 24 players from just 20 a year ago. The Bulldogs will play their first 29 games of the season away from Indianapolis in an effort to dodge the winter weather. Their nonconference schedule is highlighted by trips to warmer climates in Clearwater and Tampa, Florida, come February and March. Butler will open the 2019 season this weekend, playing indoors in Rosemont, Ill. at the Total Control Sports Invitational. The Bulldogs are slated to match up against five midwestern foes: IUPUI, Western Illinois, Evansville, Loyola Chicago and Detroit Mercy. The Bulldogs open Big East play on March 23-24 at home against DePaul.